DiscountPaint.net :: MANUFACTURERS :: AKZO NOBLE PAINTS LLC :: FLOOD FLD32 TWF-SEMI LIGHT BASE 250 VOC SIZE:1 GALLON. FLOOD FLD32 TWF-SEMI LIGHT BASE 250 VOC SIZE:1 GALLON. Flood TWF-SEMI Semi-Transparent Wood Finish is a premium-quality finish that provides long-lasting appearance and protection to natural wood. Its exclusive formula combines the rich penetration of an oil with the durability of an acrylic resin. It enhances the natural character of the wood, allowing the grain and texture to show through. 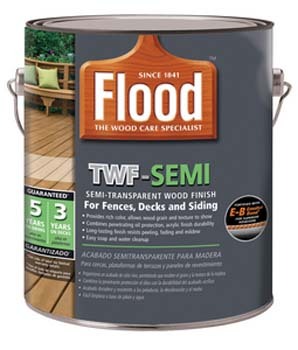 TWF-SEMI provides a mildew-resistant finish and delivers unsurpassed peel and fade resistance for three years on decks and five years on siding. • Proper surface preparation is essential for warranty application, optimum penetration and overall product performance. • Surfaces to be stained must be thoroughly clean, porous, dry and free of mildew and other contamination. • Remove mildew with a solution of one part household bleach to four parts water. • Completely remove any opaque stain, paint, varnish or sealer to expose bare wood. NOTE: Test for penetration and absorbency by sprinkling water lightly on freshly prepared wood. If water is absorbed rapidly, surface is porous and free of contamination and ready for stain. If water is repelled, thorough preparation for new wood surfaces must be repeated. The ideal time to stain new wood is one to three months after installation. Some new wood surfaces, like smooth cedar, can have a hard, shiny surface called mill glaze, that prevents maximum penetration of a stain. All new wood, especially decks, should be prepared with Flood Wood Stripper or FloodPro® Stripper/Cleaner (1 quart of Flood Wood Stripper per one gallon of water) to open wood so it can accept a new finish. These products reduce mill glaze and remove natural wood chemicals and other factory applied sealers to open wood to allow maximum penetration. Uncoated wood surfaces that have weathered longer than six months require thorough cleaning before staining. Use Flood Wood Stripper, Wood Cleaner or Flood Dekswood® with a pressure washer or stiff bristle brush to remove loose wood fibers, dirt and other surface contaminants. NOTE: Cedar and redwood may darken with Flood Wood Stripper or FloodPro Stripper/Cleaner. If this occurs, rebrighten with Flood Wood Cleaner or Flood Dekswood before proceeding. For optimum results, apply to bare wood surfaces. Can also be applied over previous applications of Flood TWF-SEMI. Previous stain, varnish or sealer must be completely and thoroughly removed with Flood Wood Stripper or StainStrip per product label directions before proceeding. NOTE: Custom tint using colorants that are approved for exterior use only. CAUTION: Surfaces are slippery when wet. Use caution when walking on wet surfaces during application. 1. Stir before and periodically during application. 2. Do not thin. Test color in small area. 3. Do not apply in hot sunlight or if cold, wet weather is expected within 48 hours. 4. Apply between 50° F – 80° F.
5. Apply with a synthetic brush, roller (synthetic woven 3/8”-3/4” nap depending on surface texture) or airless sprayer (.013-.017 fluid tip / 1300-1900 psi). 6. Apply an even coat, avoiding heavy application. 7. After sprayer or roller application, backbrush to improve penetration and uniformity of coverage. 8. If an additional coat is required, it may be applied after 3-4 hours. NOTE: Actual coverage rates may vary depending upon substrate type and/or conditions as well as application method. Surfaces with harsh exposure to sun, weather or foot traffic will show wear more quickly than other areas - if this happens, clean affected areas and recoat as necessary. • Clean up with warm, soapy water. • If Flood TWF-SEMI is allowed to dry on tools, remove with paint remover. • Store unused portion in tightly closed container. KRYLON 2323 SPRAY FUSION FOR PLASTIC RIVER ROCK SIZE:12 OZ. SPRAY PACK:6 PCS. SASHCO 14004 THROUGH THE ROOF SIZE:1 GALLON. GARDNER GIBSON 7111-3-20 DYNAMITE 111 HEAVY DUTY CLAY NONSTRIPPABLE WALLCOVERING ADHESIVE SIZE:1 GALLON. MAJIC 60102 8-6010 NAVY GRAY MAJIC RUSTKILL ENAMEL SIZE:QUART. OLD MASTERS 49508 SEMIGLOSS POLY PLASTIC POLYURETHANE SIZE:PINT. UGL 00919 DRYLOK FAST PLUG SIZE:1.5 LBS. WOOSTER 3923 THREE BRUSH HANDYPACK PACK:24 PCS.